Here at DK Windows & Doors we have three types of aluclad folding doors to choose from. 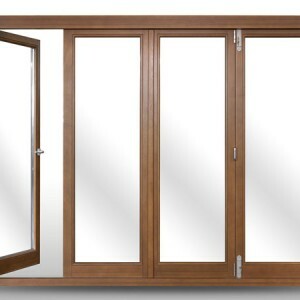 We have the aluclad & timber folding patio door, inward opening folding doors and outward opening doors. If you want to know more, why not get in touch today! 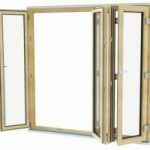 Folding doors are ideal for locations where there is a need for large openable areas: opened door leaves are fixed on the side(s) of the product. This way opening is completely clear. The product is based on same profile system as the Dk inward opening wooden window (therefore it does not have conventional threshold). In addition to traditional sideways slide opening it tilts at the top for ventilation. ROTO hinges system enables to manufacture up to 130 kg openable sash. Profiles and technical properties are similar to tild-and-turn windows. 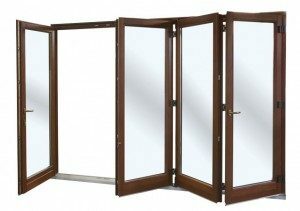 Folding door is available both as wooden and aluminium clad door. Traditional double glazing (Ug = 1,1 W/m2K) or energy efficient triple glazing(Ug = 0,6 W/m2K) can be used. 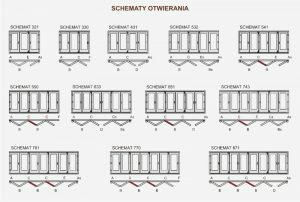 Słowińscy Company is one of the few companies in Poland that has enriched their offer with folding outward opening balcony doors based on fittings by the Australian company Centor. This unknown in Poland construction is very popular with customers in the UK and Ireland. The folding Centor is perfect for small premises, because when you open the door leaves, they are located on the outside, not taking place inside the room. The use of folding Centor gives the possibility of unique and very interesting arrangement of your home. Large glazing allows optimal illumination of the interior, and the ease of opening ensures comfort. IV folding balcony doors are based on the proven and stable construction profile of Softline windows. Their function results from specially selected, specialist fittings. This type of doors provides unlimited possibilities for a very interesting arrangement of your home. Large glazing allows optimal illumination of the interior, and the ease of opening ensures comfort.